Jewish groups up in arms over controversial comments by leading Polish officials regarding the country's role during the Holocaust. Several Jewish organizations condemned recent statements by Polish officials, which the critics deemed detrimental to historical accuracy on the Holocaust and World War II. The Federation of Jewish Communities of Russia last week took aim at Polish Defense Minister Antoni Macierewicz, for telling TVP that Russians were actually behind the mass killing of Jews and Poles that mainstream historians attribute to Ukrainian nationalists and Nazi forces. The statement by Macierewicz, who has a history of making statements viewed as anti-Semitic, comes amid other controversies surrounding allegedly revisionist statements by Polish Education Minister Anna Zalewska and other officials on the historical record of Jedwabne — a town where Poles killed hundreds of Jews in 1941. His own institution is on record as saying the act was perpetrated by Poles, though two historians from the same institution recently said an exhumation was necessary to determine what happened in Jedwabne. One of them, a deputy director, said Poles who killed Jews at Jedwabne were avenging Jewish mobilization to oppress ethnic Poles during the occupation of Poland’s east by the Soviet Union from 1939-1941. Zalewska remained noncommittal in a television interview on this matter last week, saying she could not determine who killed Jews at Jedwabne. In a statement Thursday, World Jewish Congress President Ronald Lauder demanded Zalewska apologize. He noted that Macierewicz, her colleague at the right-wing Law and Justice Party that won the general election last year, also cast doubt on Jedwabne. “Is the hubbub surrounding Jedwabne intended to eclipse the responsibility of Jews for Communism and the Soviet occupation,” Macierewicz wrote in 2001, according to Lauder. In the interview for TVP last week, Macierewicz spoke of the Volyn massacres, which Ukrainian nationalists perpetrated against ethnic Poles in 1941-1943 under the auspices of the German Nazi occupation of Poland and Ukraine. In parallel, the Ukrainian nationalists assisted in the killing of some 200,000 Volhynian Jews. “We should not be prevented from seeing that the real enemy, the one who used parts of the nationalist Ukrainian forces for this terrible crime of genocide, seems to be Russia,” Macierewicz said. 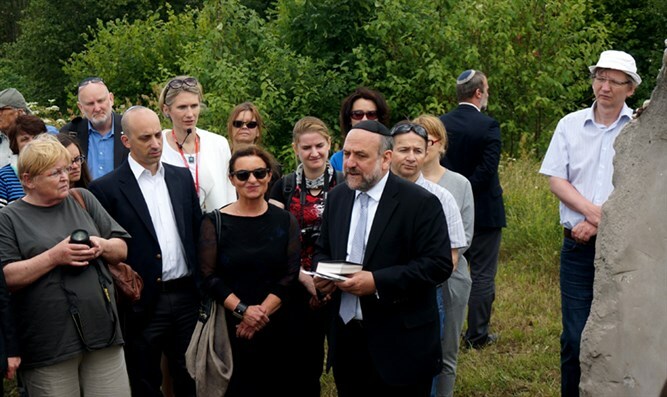 Boruch Gorin, a senior rabbi within the Russian Jewish group, was quoted by the Kresy news website as saying that Macierewicz “sacrificed historical memory in favor of a false one for political gain” and to the detriment of Polish-Russian relations. In recent weeks, the Polish newspaper Gazeta Wyborcza unearthed earlier revisionist statements by Macierewicz on the Holocaust. In 1996, he wrote in the newspaper Glos, in which he worked as an editor, that Poles did not kill Jews in the town of Kielce in 1946, despite ample historical proof that dozens of Holocaust survivors were killed there by Polish police and civilians. Last year, the Anti-Defamation League urged the Polish government to reconsider their nomination of Macierewicz citing his statement in 2002 in which he said that the anti-Semitic forgery “The Protocols of the Elders of Zion” contains some truth. Separately, the president of the Union of Jewish Communities in Poland, Leslaw Piszewski, complained in an interview for the Judische Allgemeine that the Law and Justice’s government under President Andrzej Duda was ignoring the community and delaying restitution of property nationalized from Jews during communism.